‘You can’t give people pages to colour mum, that’s just disrespectful’, my daughter said some three years ago. Of course, mums know best and daughter has now eaten up her words. During our many visits to residential care homes, we have found elderly and people living with dementia being offered children’s colouring books. We agree that any form of activity, even just talking, enriches social care for well-being. And Yes, colouring books are inexpensive. And now we can provide our elders with even greater respect. Assessing the amount of people who wish to colour but may feel uneasy at Hobson’s choice: children’s colouring books, we decided to prepare our own collection of interesting scenes to colour. 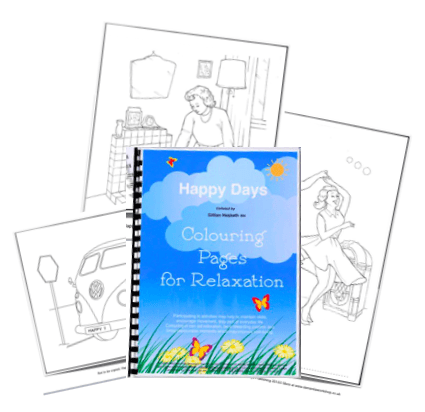 In place of the child-age images, we have a range of 1950s and 1960s scenes to prompt conversations when participating in the colouring process. Instead of an awkward book to fold back and lean against, we include individual cards which are easier to handle. To replace the thin or rough paper, we supply clean white 160gsm card. Happy Days images have a frame printed around the edge so that people can enjoy a sense of mastery or display their art work.